Not only are you getting a gorgeous oven door towel, but you get a matching dishcloth as well. 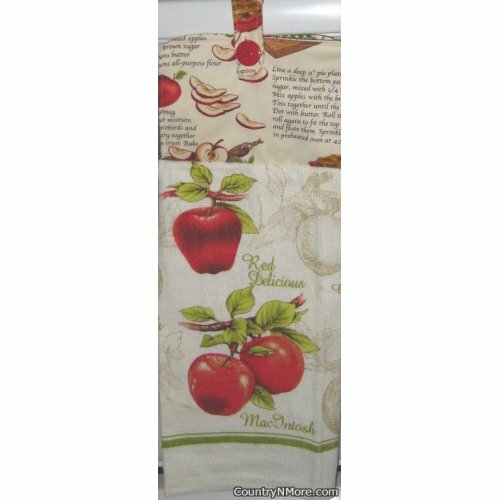 This oven door towel is similar to the other Country Apple Pie oven door towel, but instead of using a lightweight towel, this one is made using a terry kitchen towel. Fresh Red Delicious and MacIntosh apples are sitting on the trees, while toile apples are in the background. A country apple pie recipe print was used for the fabric top. Now, you will only see parts of the pie recipe and each oven door towel is unique, since the placement is different from one oven door towel to the next. We use full length towels for all of our oven door towels, and every oven door towel has a button closure.